You remember KFC's Double Down Sandwich? Two deep fried chicken breasts, two pieces of cheese and bacon. About 500 calories. Well Friendly's restaurants have a new burger that makes the Double Down look like diet food. 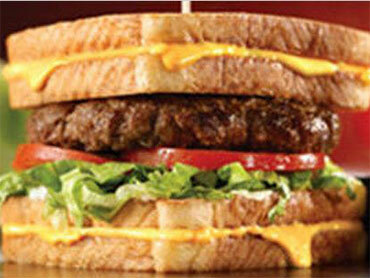 The new Ultimate Grilled Cheese Burger Melt replaces the traditional bun with two grilled cheese sandwiches. 1,160 calories. But these mega calorie burgers are gracing menus at a time when we know more about obesity than ever before and many restaurant chains list calories on the menus. Gary Foster is the Director of Temple Universities' Center for Obesity Research and Education. He thinks he knows who this appeals to. "It may be adolescent males who think "I don't have to worry about calories, I'm tough. I'm macho. I'm going to live forever." Just Wednesday, yet another obesity report was released. It found obesity rates have increased in 28 states over the past year. In Pennsylvania and Delaware, 28 percent of adults are obese, in New Jersey the number is 24 percent. But like the lettuce and tomato on your burger, there is something refreshing, at least when it comes to programs targeting kids. A new study shows a four percent decline in childhood obesity among those children most at risk. Friendly's calls the new burger an indulgence for customers and it's selling quite well.